A more extreme wheelchair…that’s safer? Watch out able-bodied hikers, casual nature-walkers, and general outdoors enthusiasts, because that engine revving behind you may not belong to that dastardly logging company trying to spoil your leisure. What is it then? None other than those who are wheelchair-bound’s answer to the call of the wild. Fraunhofer, a German-based IT company, has joined with Otto Bock, another German company that specializes in advanced healthcare products, to create the “Superfourin”: a wheelchair with not only excellent off-road capabilities, but more pertinently, an onboard GPS unit that allows a predetermined control centre to both track the location of the patient or user, but also keep tabs on the user’s vitals such as their pulse. Although not a cheap replacement to the standard wheelchair, the two companies have brought with their innovation creation a host of opportunities as of yet untapped with respect to the healthcare industry and GPS technology. An example of this comes fresh in my mind from something I witnessed about 4 years ago. I was working at a local hardware store and as usual I decided to make a quick run home for lunch. Crossing the same major intersection I would always have to cross (a case where a handheld GPS would have found no better route), I noticed a fairly feeble looking middle-aged man picking up a fair amount of speed as he crossed the intersection beside me on his motorized wheelchair. No sooner had I watched him whiz by when he suddenly hopped the oncoming curb, slammed his wheelchair into the base of the traffic lights and was consequently catapulted from his wheelchair onto the unforgiving pavement. Luckily for him, this was a busy intersection with many good Samaritans only too willing to help him out. However, it was when he started to have a seizure that everyone around the incident, including myself, had the sinking feeling that this had gone from bad to worse. Then, for but one reason, worse became dire: no one in the immediate area had a cell phone. The moral of my little anecdote is that even if all of those who carry out their daily routines cannot afford or practically use a Superfourin, the concept of a GPS unit in the wheelchair promoted by these companies is invaluable. This man clearly had some sort of ailment that kicked in while he was crossing the street, and subsequently saw him launched onto the pavement into a seizure. Worse still, those who wanted to help were (by today’s standards) under-equipped communicative devices. With a GPS unit in a wheelchair, the passerby is taken out of the equation as the response is triggered by the unfortunate events themselves. With GPS technology only getting cheaper as it is further mass-produced and affordable to most everyday consumers, it seems like a logical next step to begin to apply its use in all matters where both the safety and the health of the potential users are at stake. The man in my account could have been much better served had a GPS unit been installed in the same manner as the Superfourin’s. Fortunately, I saw him in the hardware store two weeks later and he had fully recovered from the accident. Isn’t it amazing how Geographic information systems are being used so widely around the world for various purposes? Not only has GIS technology contributed greatly to marine research, aiding in the conservation of marine mammals, but it also has become a tool with which marine researchers are depending on more and more to track and protect species from extinction, as well as influence policy decisions. Marine biologist Michelle Kinzel has researched grey whales off the central coast of British Columbia. She studied the behaviour of grey whales, at first using manual methods. Gradually Kinzel began using GIS approaches for her grey whale research, skills she learned from a “sea turtle satellite telemetry project”. ArcView, plus an extension (Animal Movement) is used in her whale research. It uses several tools to study travel patterns (migration), as well as habitat features and functions. Feeding grounds for whales change over time; thus habitats and movements change depending on the type and abundance of prey available. Behavioural patterns (movement, habitat selection) are better understood from research done on specific prey types. GPS readings, along with photographs, are also taken every time Kinzel spots a whale. The GPS readings add extra information to the photo logs while contributing to data that is analyzed by the Animal Movement extension. The extension analyzes the data using a kernel density distribution, which is a more precise method of estimating the home range sizes and location of whales within their particular habitats (Smith 2003). These are but a few examples of how GIS technology can be used as a means of improving marine research. Researchers have worked with ESRI to develop Arc Marine as an integrative data platform to track great whales (Brett et al. 2007). GIS is also being used to help save North Atlantic right whales (endangered species). The leading cause of right whale mortality is impact with shipping vessels and boats. For this reason, GIS technology has aided greatly in research on North Atlantic right whales. Remote sensing techniques, such as satellites, are being used for research purposes, tracking the movement and habitat of right whales in order to better understand and potentially predict the location of the right whale populations. GIS technology is also used for tracking shipping patterns and understanding where/when commercial fishing activities, as well as other human activities, could be impacting the right whale population. The New England aquarium research center is doing more research in order to better understand the interactions between human presence and right whales, and enforce policies in order to help save the right whale population. They’ve stated that their GIS program “is helping conserve critically endangered North Atlantic right whales, track rehabilitated and released marine animals and train [their] next generation of ocean stewards” (Ris 2008). Therefore, the information and research provided by GIS technology greatly enhances the chances of saving the right whale population. Another benefit of GIS technology is its use in the marine field. GIS allows researchers/scientists to classify and study complex data through space and time (Engleby 2001). For example, the integration of specific data results on maps help identify where right whales may be at certain times of the year, or how far rehabilitated turtles might travel through satellite tracking systems. The New England Aquarium uses GIS “to explore marine environments. Mapping allows [them] to interpret relationships not visible through the tables or graphs that are more commonly used in scientific studies. [They] look for innovative conservation solutions by analyzing the spatial distribution of right whales relative to shipping lanes and the travel patterns of dolphins and sea turtles” (Ris 2008). It could be said then that GIS technology is not only beneficial to the research and understanding of marine life, but also its preservation. An Ethical Dilemma – Should Apple Use Their Many Resources to Locate Stolen iPods? There has been a lot of talk about new gadgets available to the general public, such as navigational tools that can be used in cars, handheld GPS systems, and so on. Apple’s new iPhone is just one of the many new technologies that come with GPS applications. Because these new toys are so expensive, iPhones, iPods and other similar items are often the target of theft. An ethical dilemma is then raised: should Apple use their multiple resources to help locate the stolen goods? Apple’s iPhone comes equipped with GPS, which, according to Peleg (2008), is “a “constellation” of 24 well-spaced satellites that orbit the Earth and make it possible for people with ground receivers to pinpoint their geographic location”. It is usually accurate with 10 to 100 meters. Not only can iPhones and iPods be tracked using GPS, they can also be located using Apple’s massive servers. According to Hartley (2008), the first steps after acquiring an Apple product would be to register the device through Apple iTunes, the company’s music service. To register, the client must enter the product’s serial number as well as their personal information, such as name and address (ibid.). Apple “stores this information on its server so that it can recognize an individual’s iPod” (ibid.). Whenever an iPod or iPhone is plugged in, it is “calling home to Apple” (ibid.). Apple can therefore lay out on a map the location of every Apple user in the world. They can also track the frequency of use, they can track consumption per country, per region, and so on. This tool provides locational information every time someone plugs in their iPod. The use of GIS can be harnessed for mapping and analysis of geographic data. In this instance, the information gathered by Apple’s servers could potentially, if not already, store spatial features in a coordinate system, which would reference each particular Apple user on earth. If this is the case, a stolen iPod could be located the second it is plugged in to a computer, or tracked using GPS. There are various websites dedicated to locating stolen iPods, but the true solution would be more implication from Apple. Apple has the capability of locating and pinpointing any given iPod based on the serial number. Apple’s chief executive officer also announced that “the company maintains an internal “kill switch” which can shut down and erase any application, both in the company’s online store and on every user’s iPhone, if the software is deemed to be harmful or malicious” (ibid.). If this is the case, some argue it would be possible to “kill” an iPod just as easily as it would be to erase an application. It would, however, be too expensive to create some sort of theft monitoring system, because since the launch of the first iPod, there has been well over 100 million sold worldwide. Should this type of security be a priority for Apple? In my opinion, if they are storing data containing names and addresses linked to serial numbers, one of the benefits should be the peace of mind in knowing that if an iPod or iPhone is stolen, it can be located again. These gadgets are expensive, and sometimes contain very valuable information. They can store massive quantities of information, which does make them very valuable, even if not for monetary gain. Although it would be extremely hard to track the number of lost or stolen Apple products throughout the world, perhaps a division of Apple should be dedicated to developing this program in the future. With the US presidential campaign still fresh in our memory and the Quebec provincial elections filling much of the media sphere, the Canadian Federal elections seem quite far away. Yet, just over a month ago, Canadians were asked to go to the polls and vote for their representatives. Because of the non-proportional electoral system that is in place in Canada, some electors decided to rethink their vote and follow the idea of the Project ABC (Anything But Conservative) and to go for strategic voting to reduce the Conservatives’ chances of being re-elected. Strategic voting can be described as the decision to vote for a second choice party in order to prevent an even less favorable party from winning. For strategic voting to be effective in a riding, this riding has to fulfill certain conditions: It must be a close two-way race; the other parties must have remote chances of winning; and the small number of votes for a third or fourth party must make a difference. But once one has taken the decision to vote strategically, how can they know which party has the most chances to win in their ridings? It is at this stage that GIS comes into play, through the website Vote for Environment. By georeferencing postal codes on Google Map, this site helped voters to redirect their votes in the Canadian Federal elections. Therefore, one could type in his or her postal code, and a polygon would be traced on a Google map, showing the riding’s boundaries. As postal codes sometimes cross riding boundaries, the user could also click on the map to change riding, and the new riding’s attribute table would appear. The attribute table associated with each riding contains the different candidates as well as a graph showing the likely vote totals for each party, according to the latest polls. Finally, it indicated the website’s “pick”, according to the statistics. This pick represented the candidate for which one should vote for not to get the Conservative candidate to pass. As it is a non-partisan website, if the Conservatives did not have a chance to get the riding, it would just indicate to “vote with your heart”. Also, following the strategic voting conditions, the website did not suggest a candidate unless he or she “could have won in 2006 if at least one-third of the opposition party supporters had voted for the leading opposition party in that riding”. Gerrymandering, a form of redistribution that deliberately rearranges the boundaries of districts to influence the outcome of elections, often comes to our mind when we think of the implication of GIS in the political sphere. Even though the strategic voting method suggested by Vote for Environment has not been able to completely achieve its objective of preventing another Conservative government in Canada, it has shown an interesting way of using accessible GIS information to enhance community mobilization. November 24th, there was a discussion section on putting accountability into accounting. As the discussion was commented on before by thecynicaloptimist, I will discuss the aspect of discussion that most struck me: Greenwashing. Greenwashing undermines actual attempts to save the environment. The main issue I see is that greenwashing is turning environmental accountability into a trend. Professor Cho talked about companies that were on the top 100 toxic companies list, yet who still had the support of their consumers because of the way they advertised their company. Their websites were appealing and showed a positive face, but they are still the companies with the greatest negative impact, if they are on “the list”. In addition there are the awards for best sustainability report, which are not always verified or audited. Is awareness of this trend prevalent enough to the consumer? Not for all consumers if they are attracted by the company advertising and not the company’s actions. However it is the consumer’s duty to look into which companies truly merit our support. Should these elaborate displays of environmental efforts truly be a facade, when the real situation comes to surface, we would be disinclined to believe environmental efforts are actually successful, thus shortening the lifespan of the “green trend”. The question still remains how do you put accountability into accounting. It appears to me that rules would need to be enforced. A proposal was made for an environmental tax on what’s produced, like a Pigovian tax. Perhaps an environmental tax may put it into the minds of producers that being efficient in reducing environmental impact is serious. Another comment had been made that students in the school do have the idea that being green is just a business trend to get access to the market. This further reinforces the idea that green is just a trend. Educating the masses that greening products is more than another business ploy that will work better or worse than another method would help accountability. If environmental accountability were a duty, and not a tool there would be fewer alternatives to this duty and it would be thought of in earnest. I believe this educational process is already taken place just by the fact that this comment was brought up, and the fact that we are currently undertaking environmental courses now. Google Maps is a digital earth that displays the inter-relationships of geographic information systems. These inter-relationships include; distances, directions, duration, adjacency, and property boundaries. Google uploads this geographic information systems (GIS) data and makes it available to the public. The public finds the geospatial information they are looking for through visual inspection. They can search for information by address; type; name; what, where; moving and viewing (clicking on a point on the map and dragging it until you see your area of interest). Google maps help us to find our way around the world. It provides us with the basic layers of navigation needed for people to find their way around areas (roads, highways, parks etc). The special characteristic of Google maps is that anyone can create their own maps. All you have to do is create your own Google account. When done properly and with good intent, personal maps can be useful. They allow citizens to give short cuts or personal directions to places, such as winter cottages for the thanksgiving supper. They allow people to update the maps after natural disasters so love ones can come and get them. For instance when the radio station KPBS maintained an up-to-date map of the fire situation in San Diego. This allowed residences of the area to check in and see if their properties were affected by the fire. Google Maps also have their down sides. As with most public accessed sites, you get the characters who like to just play around with the software for no apparent reason and confuse people who are looking for important information. Take for instance the map of where the things in Cloverfield happen. This is a map displaying the major scenes in a movie. Although it is intended for a certain audience, anyone can look at it. Most likely it annoys people who are searching for actual places in that area and get this map as their result. As wonderful as Google maps are in how accessible they make maps to be, they can also slow people down and distract them from their original intentions. Something that a good old fashioned Atlas could never do. But overall Google maps have been a very positive addition to the Internet and GIS. Last.fm is a free online service that offers its users the ability to both catalogue and track their current music listening habits as well as to expand their tastes by creating personalized recommendations and streaming radio stations based on aggregated data of user preferences. For example, the algorithms are able to match you with “neighbours” who have similar musical tastes and make suggestions based on artists you haven’t listened to but your neighbours have. The accuracy improves as you listen to more songs and log them in your profile. The success of last.fm (it has millions of users in almost every country in the world) has enabled it to track broad trends in music listening worldwide. Weekly charts are compiled that show the top songs and artists overall, as well as the fastest-gaining tracks and musicians. Last.fm has made a recent foray into the world of iPhones, in which users gain access to their own personal radio stations while on the move anywhere in the world. This application has made it clear that there is much potential both to expand the applications of this technology. Tim Walker, writing in The Independent about the possibilities of moving data storage online into a “Cloud” says that, “If the iPhone and Google-phone allow their owners to listen not only to their own music libraries but to any music at all via the Cloud, they will quickly make that old-fashioned data-storing device, the iPod, redundant.” I offer this anecdote only to demonstrate the potential for massive amounts of data to be collected and shared about music listening habits with relative ease based on existing technology. What is most fascinating, and has not yet been discussed, is the potential for Last.fm to make charts like the Billboard Hot 100 irrelevant. Billboard’s decision to include online music sales in the formulation of charts shows that they’re aware that the future of music can be found on the Internet. But if the vast majority of music is being either downloaded illegally or streamed legally from sites like Last.fm (or potentially from other networked users), then a lot of real life listening is going unrecorded and is thus not reflected in what is defined as “popular”. Last.fm could make popularity a lot more democratic than it is now, with radio play and album sales largely determining chart placements and a spot in the cultural canon. Not only could Last.fm lay bare the hidden epidemiological workings of how music trends take off, it could actually modify how those trends work. If users have access to millions of songs, they’ll probably start by listening to what’s already popular or on the rise. Thus something could become a hit due to the snowball effect of online users selecting it without any marketing campaign whatsoever. What does this have to do with GIS? Last.fm currently asks users only to identify their country and time zone. If it asked for more detailed information, or merely used IP addresses to determine location, and encoded every track submitted to the database with this information, the potential for customized charts is limitless. Charts could be compiled detailing the top artists and songs at the level of neighbourhood, city, province or country. You could ask for the top artists among users living within a 50km radius of yourself. In advance of moving to a new town, anxious teenagers could find out which bands everyone at their new high school was listening to before they even arrived. Obviously, this information would be highly sought after amongst marketers of just about everything: musical taste has a well-documented relationship with the consumption of style and accessories. Spatial location is only one type of data that could be linked to music listening – any demographic trait would work equally well. Charts could be created based on age, gender, income etc. Last.fm has already begun to make some spatial connections with user data through its “Events” pages. Users can indicate which concerts they plan on attending by selecting their nearest city, and Last.fm can notify you if a band in your “library” will be playing near you in the future. This could be expanded to include record stores and other music-related business ventures. The level of public availability of this data will therefore be of huge importance. If Last.fm, owned by CBS Television, chooses to make everything public (while maintaining user privacy), this could be of great interest to everyone from sociologists studying social trends and cultural capital to musicians interested in genre and audience reception. If Last.fm releases the data selectively or at cost, it will serve the interests of record labels, radio conglomerates and concert promoters attempting to find profits on the internet to replace stagnating revenue streams in their traditional markets. Last.fm now enables streaming of Billboard hits. This is the bare minimum of the potential offered by this technology, which could rewrite how Billboard hits are themselves calculated. Although not spatial in nature, this map of Last.fm artists demonstrates the potential for drawing connections between artists and listeners based on user-generated tags and listening statistics. A look at how people are willing to pay for the “right” music at the right time and in the right setting. Last.fm essentially offers this service for free already – listeners can select from user-generated tags and stream a radio station of music tagged “relaxing” or “playful”. Adding spatial data to last.fm could enable the option of radio stations linked to particular places or atmospheres, like music popular in the Caribbean or the Rockies. An overview of the “Cloud” and how Last.fm could gain popularity under this system due to availability on wireless devices. While the Modern Language Association, or MLA, is best known for its tedious citation rules and linguistic pedantry, it also contains one of the most interesting, user-friendly geodemographic tools on the Internet: the MLA language map. The language map is an interactive tool that allows you to view the United States, or individual states, divided by county or ZIP code. It then displays either the percentage or absolute population of primary speakers of any of thirty-three languages, from Spanish to Hungarian to Navajo. The map uses data from the 2000 US Census, which joins individuals’ native language data with the populations and locations of their towns and cities. Its intuitive, intelligent, easy-to-use design makes it fun to generate thousands of variations. 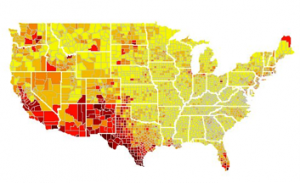 The map uses vector data, in the form of ZIP codes or counties, and stores the relevant data (total population, political boundary nodes, and populations of individual language-natives) in an attribute table. The requested data is compiled newly into a map upon request, making this a true GIS. The site also allows you to simultaneously make, view, and compare two maps of your choice. Language use in the United States (and anywhere!) is crucial demographic and sociological information. Although English is indisputably the States’ lingua franca, knowing the second languages of minorities in certain areas, and how widely used these languages are, can benefit corporate marketers, government service providers, and individuals. It can also speak volumes about the linguistic, and thus cultural, history of a region, highlight centres of cross linguistic exposure, and generally enrich one’s understanding of a region. For example, the following is a map produced by this GIS in which I have requested the percentage of people who speak languages other than English at home to be shown by county. Darker regions represent higher percentages of such speakers. This data clearly highlights the areas of the United States in which languages other than English predominate. Such information could be very useful, for example, in the budgeting of funds towards local multilingual initiatives. Northern Maine, western Texas, and southern Florida are clearly in greater need of multilingual support than are the entire states of Alabama, Kentucky, and Missouri. Other uses might use language distribution to infer the availability of certain cultural products. For example, an Orthodox Jew on a road trip through New York State might wonder where kosher food is available. The following map looks at concentrations of Yiddish speakers by ZIP code. In this case, darker ZIP codes represent higher concentrations of Yiddish speakers. In the state of New York, most counties are coloured white (zero Yiddish speakers) or grey (between one and ninety-nine speakers). However, one ZIP code in Orange County shows up as purple (between 20,000 and 39,999 speakers). Zooming in shows the ZIP code of this town and further investigation shows that it contains the Village of Kiryas Joel, an entirely Orthodox village where Yiddish is the primary language and, indeed, many stores sell exclusively kosher food. These are just two of the many permutations for which the language map is useful. Spend a couple hours playing with the tool and you’ll find many more. I attended, along with Sophie and J.F., two OURANOS seminars 20 November 2008. Both seminars were focused on hydrology and climate change. The first, given by Hydro-Quebec, explained their research and modeling of future hydrology in Quebec under various climate change scenarios. The second was presented by two affiliated OURANOS scientists researching the impacts of climate change (especially rising water levels, changes in ice quantity and patterns, and erosion) on the St. Lawrence shoreline. Related to these seminars was the OURANOS seminar and article about participatory climate monitoring in Nunavik communities along the Hudson Bay shoreline. When I thought about these Quebec-climatic themed topics together, especially with respect to Hydro-Quebec, I started wondering about the history and future of indigenous land rights in Quebec. Hydro-Quebec, with government support mind you, has displaced countless native communities through the building of hydroelectric dams and associated flooding of surrounding lowlands. While the Cree are likely the best recognized community in Quebec, there are many more, including Huron, Micmac, Abenaki, Algonquin, Mohawk, Montagnais, and Naskapi. Many of these communities have been displaced and neglected, and are now face a serious threat from northern climatic shifts (such as declining safe ice routes, as described in the circulated article). It is commonly believed that the most marginalized people in the world will feel the affects of climatic changes first and most severely. This is in part due to higher reliance on natural services for substance living, but also because the wealth required for building and organizing environmental disaster relief systems (i.e. reinforcing coastline storm breakers, evacuation procedures, and backup sources of clean water if wells are flooded or contaminated) is concentrated outside of these communities and/or their respective countries. In the case of Canada, we are a wealthy country that fails to allocate equal rights and services to native communities. These communities live in the periphery zone; outside the privileges most people would associate with be Canadian. We live in the core, in Montreal, Ottawa, and smaller southern communities which are the core political, economic and social regions in Canada. The ridge between core and periphery is pronounced and an embarrassment to Canada. I attended a lecture given by Stephen Lewis two years ago at Dalhousie University, Halifax, during which Mr. Lewis explained an experience he had while discussing human rights violation at United Nations meeting. He recounted how, out of shear embarrassment over the way native peoples were treated in Canada, he eventually refused speaking out against other countries for human rights violations. Personally I think that is a huge statement, considering the conflicts, genocides, imprisonments and extreme poverty that exist in various countries. I point I am hoping to make is that many native communities in Quebec and Canada have and continue to be afflicted with human rights violations, some living in a third world situation within Canadian borders. Climate change and all associated environmental shifts are predicted to increase and worsen worldwide, with northern areas being the hardest hit. It is my opinion that as climatic changes increasingly alter Northern environments (particularly temperature and hydrology) native human rights issues in Canada will be exacerbated. When researching and discussing climate change in Canada and Quebec, it will be important to assess the concerns, safety, and sustainability of northern native communities. Google.org’s investment of “More than $14Million for genetic and digital detection” is the title of a blog post that I recently came across. Under a program called Predict and Prevent, Google is working with Healthmap.org and Promed-mail.org to tract the outbreak of infectious diseases across the world through digital and genetic approaches. These three organizations work together to use GIS to display geospatial data on global disease alert maps. Each pushpin on the map is related to a dialogue box which gives you the latest epidemic/infectious disease outbreak in a country. For example, by clicking on a pushpin located in Sudan, a dialogue box will give you a link to promed-mail, which will give you the updates on how many patients died from Cholera, diarrhea, and dysentery diseases on a given date and given location in Sudan. 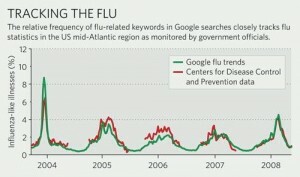 Through its maps, Google.org wants to distribute knowledge about infectious diseases. This in turn empower communities and individuals, because they have more rapid access to the data that can help reduce to time of response when dealing with a health crisis. Indeed, by funding partners to collect geospatial data through digital detection, Predict and Prevent can help detect early indicators of a certain disease, in order to prevent that it become a local, regional and global epidemic. In golf, more than any other sport, there seems to be a huge market for accessories that claim to “improve your game” without you having to do the actual work to improve. I know someone who has them all: A fishing pole to get golf balls out of ponds (why don’t you just avoid them in the first place? ); brush-tees which supposedly give you greater accuracy and distance on your drive (they don’t help if your technique is bad); sunglasses that make lost balls stand out from the grass (but which also look ridiculous); and many, many more. Location-based services and technology have also gotten in on the action. A GPS system called Sky Caddie was introduced a few years ago. The device contains detailed layouts of many major golf courses (more are available for download). It calculates distances between the receiver and specific target points, such as a sand bunker or the green, and tells how far you need to hit and in what direction. A more recent addition to a golfer’s gadget collection is the RadarGolf System, available for $200. It allows golfers to locate lost balls with radio frequencies. The balls have RFID chips embedded in them, which are sensed by a handheld device using RadarGolf’s “Ball Positioning System (BPS™)”. When you lose your ball, just take out the device and wave it in the direction your ball went/may have gone. It’s more high-tech than the ball-finder sunglasses, but I think it makes you look just as silly. Still, for some it may be worth it to get the best score and not have to take an extra stroke for losing a ball. 1. GiSTEQ PhotoTrackr: A geotagging device that syncs with your digital camera to record the exact location of your photos. 2. Blackline GPS Snitch: A device you attach to your car that sends real-time information on its location to your mobile phone. 3. BrickHouse Security Locator Plus: Attach RFID tags to your important belongings so you can find them when they’re lost with the portable receiver. 4. Qstarz BT-Q1000P Bluetooth Data Logger, http://www.semsons.com: This device turns your PDA into a navigation system while it logs your trajectory, which you can later upload and view on Google Earth. Only a few hours after terrorists struck Mumbai, India late this evening, The New York Times already has an annotated map of the attack locations up on on its web site. The interactive graphic presents a basic street map of the city, with small icons to designate the sites of the coordinated attacks. Rolling over a site presents a short description of the scene, and for some stories, links to some of the Times’ own photos. Over at Google Maps, user generated content is piling up. Twitter is buzzing with news reports, and a few primary sources. Some people have tagged photos on flickr as well. Wikipedia also has a startlingly well updated page, along with a smaller, less updated map. The Times’ web based GIS display has proved impressive in the past as well. Just last month, their live map of election results was one of the best on the web, carrying news stories about various polling places alongside live returns. And during the Summer Olympics, they built an interactive medal count map that grew as the games progressed. The success of these live GIS endeavors is just another example that, with the right software in place, news reporting can instantaneously take on an entirely new dimension. This helps those in need of quick information to stay safe and satisfies the curiosity of readers around the globe. On May 12th 2008, a dreadful earthquake cast its shadow on the lands of Sichuan province in China. Nobody had a prior knowledge of how big a catastrophe the earthquake would be and how big a task the Chinese government would have. At beginning of the earthquake, telephone landlines, signal sending and receiving towers, network centers, roads and highways, all the means of communication were destroyed. Meanwhile, access to clean drinking water, foods, and other life saving supplies was totally interrupted. Residents in those areas that were located around the center of the earthquake were the most severely impacted and seemed to be helpless and isolated from outside world. The injured would have died if help didn’t arrive on time and fatal infectious diseases would have spread with incredible speed if medical prevention were not set up immediately. Fortunately, equipped with GPS, rescuers could have precise information of where they were in the ruined areas and were able to send back geographical information report using their GPS receivers and the satellites. Because of this modern means of positioning and communicating tool, the first fifteen paratroopers successfully arrived in the most damaged and isolated areas. After their arrival, other rescuers knew how to get there and what kind of help was needed. GPS therefore played a very important role in this catastrophe. A perfect example of this three-part system in application is the Southern California Integrated GPS Network (SCIGN.) SCIGN is a network of continuously recording GPS receivers throughout Southern California that have been installed in an array to monitor the strain accumulation in Southern California’s crust. This is done with the help of the highly accurate measurements made by the GPS system which allow scientists to record millimetre-scale slip on faults that cannot ordinarily be measured. Understanding of area seismicity could lead to a better understanding of the mechanics behind earthquakes and to better assessment of earthquake hazards and damage estimates. Scientists from NASA/JPL, Scripps Institution of Oceanography, and the U.S. Geological Survey use the data from this array to determine if small-scale motion on faults between earthquakes can indicate precursor signs to an event that may help to predict where and when an earthquake will likely occur. Apart from its positioning, communicating and measuring function, GPS can also be used in terms of early earthquake warning. As an integrated GPS warning system already been established in California, once earthquake occurs, prepared action like a shutting down of gas lines will be automatically done. It not only enhances the speed of response to earthquake but also reduces avoidable life and property lost. Most people are well aware that the state of California is a hot bed for tectonic activity, which means if you’d like to avoid earthquakes, California is not the place for you. The reason there is such a high number of earthquakes in California is because running for 1,300 kilometers right down the middle of the state is the San Andreas Fault line. What is this Fault line you ask? Well, it’s where the Pacific and North American tectonic plates meet. And because tectonic plates have this funny little tendency to move around and bump into each other, Californians have been putting up with a good deal of seismic disturbance for quite some time. Naturally, there has been lots of studies done on the San Andreas Fault, trying to deduce when exactly the next big earthquake will come, big meaning achieving a rating of 7.0 or greater on the Richter scale. We know these earthquakes are coming but we don’t exactly know when they are going to occur. The best way to minimize casualties and maximize rescue and relief operations efficacy is to be extremely well prepared. On November 13th, 2008, at 10:00 am, millions of people in Southern California took a big step towards preparing themselves for the ‘big one’. It was called the ShakeOut Drill, and it was the largest earthquake preparedness drill in U.S. history. All these people were simulating how to deal with, and how emergency services would respond to, a 7.8 magnitude earthquake. The projected damage of an earthquake of this magnitude is estimated to be about 2,000 deaths, 50,000 injuries, and $200 billion worth of other damages. That scenario is definitely something you want to be prepared for. GIS helped collect and manage large volumes of diverse data including simulated damaged buildings, roads, and power and water infrastructure; affected populations; delivered supplies; and the deployment of fire, emergency medical services, law enforcement, and homeland security staff. Live data, such as weather updates, video, and Global Positioning System (GPS) information, was streamed into the GIS database and disseminated to individuals using desktop computers, mobile devices, and Web-enabled laptops. Mobile GIS helped field crews collect remotely sensed data that was automatically sent back to the comprehensive spatial database. One can’t really argue with the fact that GIS was essentially the main component of the entire simulation. This is a very excellent example of how GIS can be used to increase the efficacy of relief efforts in the face of a natural disaster, something we have all already seen in Assignment 3 of our Intro to GIS course, where we created some targeted emergency relief maps for the fictional earthquake centered in McGill campus. This definitely points to the fact that GIS can be a very useful tool for quick and effective disaster relief, provided that accurate geospatial data has been collected prior to the disaster, as this was the case for the simulation. How did dinosaurs disappear? Was it because of volcanic activity, diseases or a meteorite impact? Most clues have led us to believe that a meteorite impact near the Yucatan peninsula caused the famous massive extinction. A meteorite with a diameter of 1 km hitting the Earth’s surface would produce intense volcanic activity and a global tsunami, and send huge amounts of dust and water vapor into the atmosphere thus changing the Earth’s climate dramatically. Collisions with objects with a 1 km diameter occur on Earth, on average, every 250,000 years. Considering the fact that the Earth is about 4 billions years old, meteorite impacts can be viewed as an important process in the Earth’s history. The study of craters may teach us many things about the Earth and our solar system, and may help us to resolve others mysteries. But before we study craters, we need to find them. Craters from a meteorite with a 1 km diameter, however, are so large that they are difficult to see from the Earth’s surface and searching can be very time consuming and expensive. Fortunately, GIS can be used to make finding craters easier. Recently researchers in Norway used the automatic detection of circular depression in digital elevation data to locate craters with 5 to 10 km diameters. They used a template-matching technique to measure the similarity between digital elevation data and a known image. They used the following 3 types of craters as templates: 1) the simple crater: bowl-shape depression with surrounded rims, 2) the complex crater: central peak surrounded by trough and slumped rims, and 3) the peak ring crater: a central peak with several ring structures creating an annular basin. Their study shows that morphometrical DEM analysis provides a powerful and inexpensive tool for landform assessments of crater-shaped features. The virtue of GIS is not limited to Earth. Since the morphology of meteorite craters displays similar patterns throughout the solar system, other research used GIS database to compare craters on Mars and Ganymede (the larger natural satellite of Jupiter) using data from the Galileo probe and creating a catalog that includes information on crater location, size, the state of preservation state, geologic unit, ejecta morphology and interior morphology. Such research can help us understand the different environment and surface composition of other planets too far to be reached or too hostile to visit. Atoc 250, 2008, Natural Disaster: Meteorite impact, McGill University. Barlow N. G., Comparison of Impact Crater Morphologies on Mars and Ganymede, Dept. Physics and Astronomy, Northern Arizona University, Flagstaff. Though Geography Awareness Week 2008 has officially passed, it is never too late to promote awareness for the Mississippi River System, especially when GIS can play a vital role in its maintenance and management. The Mississippi River System is more complex and expansive than most people realize. Water at the port of New Orleans could come from as far north as Minnesota, as far west as Montana, and as far east as Western Pennsylvania. When in perfect working order, it services the vast majority of American land, and is vital to its economy and trade. GIS can help monitor the river system due to its unpredictability. The Mississippi rarely maintains a consistent path: in fact, if left to its own devices, it would most likely miss New Orleans and render the city worthless as a port. While levees help keep New Orleans’ economy fertile by steering it through the Big Easy (and give the locals a poor excuse for topography), they tend to exacerbate area flooding because of the artificially high water levels created by the man-made hills. Thus, GIS can work on the Mississippi by checking its current course (i.e., making sure that its path is not overly anomalous) and by verifying the safety of its water levels. Of course, it could also check if it is too wide, for if it is, it would probably signify a flood or a levee breach. In GEOG 201, we have already seen GIS at work in the Mississippi River System: one of our assignments looked at mines in Louisiana’s Plaquemines Parish. It is our duty to make sure our use of GIS is not merely a pedagogical exercise, but a way to educate students of world problems by using today’s industry standard tools and software. Drainage. 5 Jan. 2006. Teaching with Hurricane Katrina: The Physiography, Climate, Storm and Impact. 5 Jan. 2006. Science Education Resource Center at Carleton College, Montana State University. 25 Nov. 2008 . Steif, Colin. “The Jefferson-Mississippi-Missouri River System.” About.com. 17 Nov. 2008. The New York Times Company. 25 Nov. 2008 . During the Symposium of OURANOS, many researchers demonstrated how models can help decision makers to develop mitigation and adaptation methods to face climate change. One of the lecturers briefly mentioned that researchers working on ice monitoring in Northern Quebec were providing formation to local communities, so that resident learn to collect data about the ice distribution and thickness themselves. Since we have been discussing a lot about scientists responsibilities to share their knowledge, I thought it would be interesting to push the discussion a bit further and that is why I sent you the article Climate Change in Northern Quebec : Adaptation strategies from Community based Research, which describes the integrated community-based monitoring program that was developed In Nunavik in order to study the variation of ice. By bridging scientific and traditional knowledge, the program aim to create a tool that will allow northern communities to get daily information on the ice state on which they depend for transportation purposes. During our discussion session in ENVR 650, it has been argued that using multidisciplinary approach (this time meaning to gather together researchers that come from different disciplines on a specific topic) can represent an advantage in environmental studies. Thus, it seems that linking policy makers, scientists and local communities also represent a good way to improve both knowledge and policy making process. What I really thought interesting about this program was the fact that the scientists involved had a real desire to make the information as accessible as possible. For instance, scientists collected comments from the users of the ice-monitoring tool to make it as user-friendly as possible. As scientists working on a very specific topic, we, as a Prof. Sieber said, write papers that only 10 people or so can understand. Thus, I would really want to applause this initiative to share knowledge with people that have to deal with the issue that is studied. I also think it is a great idea to form these people so they can collect data by themselves. Even thought it may not be considered as being a specific responsibility of researchers, I think that the scientific communities should support and favour the democratisation of knowledge. After all, as Dr.Carpenter suggested it in his conference, education can be one of the more efficient tool to improve the condition of environment. You are currently browsing the Computers, Society, and Nature blog archives for November, 2008.